This magnificent portrait hangs in the gallery appropriated to the orks of the Italian masters in that unrivalled collection, the Louvre at Paris. Its beauty as a work of art is not seen at th first glance; it is a picture which requires to be surveyed Avith attention. It is not by the grandeur of the Outlines, nor by the beauty of the* colouring, nor by the elegance of the costume, that this head fixes the attention of the spectator. It is by the expression of deep thought Avhich is read in those delicate features, and Avhich Leonardo da Vinci, the greatest of the predecessors of Raffaelle, Avas the first to excel in representing. It is .uncertain whether this portrait is that of Charles VIII. or of his successor, Louis XII. The artist did not take “up – his residence in France, at the invitation of Francis I., until 1515, and only survived the change of abode five years, during Avhich he suffered almost continually from ill health. Both the monarchs, whom it has been’ supposed this portrait may represent, visited Italy, but in the character of hostile invaders. Charles VIII. was at Florence, where Leonardo da Vinci then resided, in 1494, and at which period the artist may have painted his portrait. 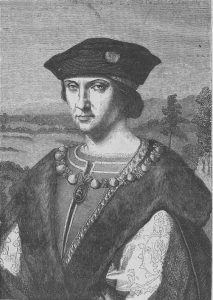 Charles died in 1498, and though’ his successor invaded Italy, in order to carry out his ambitious designs on the kingdom of Naples, it does’ not appear that he ever resided at Florence. Moreover, he was held in execration by’the Italians, on account of the calamities Avhich he brought upon their country, the horrors of the storming of Brescia, the cruel execution of Count Avogadro and his two sons for their patriotic resistance to the invader, and other atrocities. For all these reasons, it is much more probable that the portrait is that of Charles VIII. than of his cruel and ambitious successor. Leonardo da Vinci may be regarded as the first ‘painter who of idea and dignity of form. In the expression of character, and the just delineation of the affections and emotions, he surpassed every painter who had preceded him ; and it detracts nothing from his merit to acknoAvledge, that he was excelled in this sublime department of art by Raffaelle, who rose into celebrity as Leonardo disappeared from the stage Avhich he had trod so worthily. Fuseli thus sums up the character of Leonardo as a painter “The universality of Leonardo da Vinci is become proverbial; but though possessed of every element, he rather gave glimpses than a standard of form ; though full of energy, he had not powers effectually to court the various graces he pursued. His line Avas free from meagreness, and his forms presented volume ; but he appears not to have ever been much acquainted, or to have sedulously sought much acquaintance, with the antique. Character was his favourite study ; and character he has often raised from an individual to a species, and as often depressed to caricature. The strength of his execution lay in the delineation ot male heads; those of his females owe nearly all their charms to chiaroscuro, of which he is the supposed inventor; they are seldom more dis criminated than the children they fondle ; they are sisters of one family.” Some of the best Avorks of this master were executed eluring his second residence in Florence, Avhich was probably the period when he painted the portrait we have engraved. His execution is elaborate and careful ; and he left many of his works in AA’hat he considered an unfinished state, though others could see no defect in them. In subjects Avhich he undertook to complete, he not only imitated the brightness of the eyes, the roots of the free from meagreness, and his forms presented volume ; but he appears not to have ever been much acquainted, or to have sedulously sought much acquaintance, with the antique. Character was his favourite study ; and character he has often raised from an individual to a species, and as often depressed to caricature. The strength of his execution lay in the delineation ot male heads; those of his females owe nearly all their charms to chiaroscuro, of which he is the supposed inventor; they are seldom more discriminated than the children they fondle ; they are sisters of one family.” Some of the best Avorks of this master were executed eluring his second residence in Florence, Avhich was probably the period when he painted the portrait we have engraved. His execution is elaborate and careful ; and he left many of his works in AA’hat he considered an unfinished state, though others could see no defect in them. In subjects Avhich he undertook to complete, he not only imitated the brightness of the eyes, the roots of the hair, the pores of the skin, and even the beating of the arteries, but portrayed each separate garment and every accessory with the same minuteness. At the same time he led the way to a more enlarged and dignified style, and smoothed the path, so to speak, for the appearance of Raffaelle.